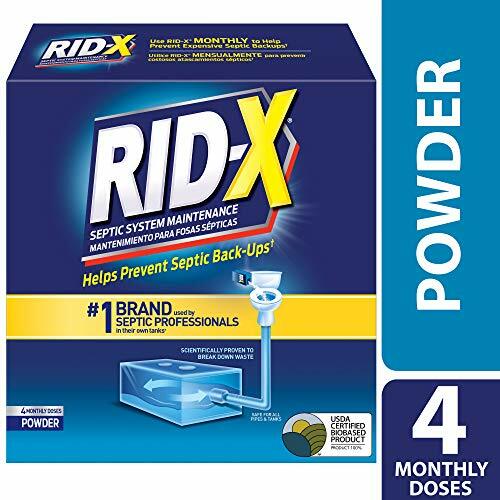 From the #1 Brand* in septic system treatment, RID-X Septic Tank Treatment Powder helps prevent septic backups** by continuously breaking down household waste. RID-X helps maintain a healthy balance of septic bacteria throughout the year in order to prevent expensive septic backups. The natural bacteria and advanced enzymes start working immediately to break down paper, protein, oils & grease. RID-X is natural & safe for pipes and septic systems. Always remember to use RID-X once per month along with regular pumping. 9.8 oz is 1 monthly dose for septic tanks up to 1500 gallons. To use, simply pour powder down the toilet and flush. *Based on national Nielsen sales data. **Along with occasional pumping. If you have any questions about this product by Rid-X, contact us by completing and submitting the form below. If you are looking for a specif part number, please include it with your message.